Every day needs a little coffee in it. Even your wedding day. 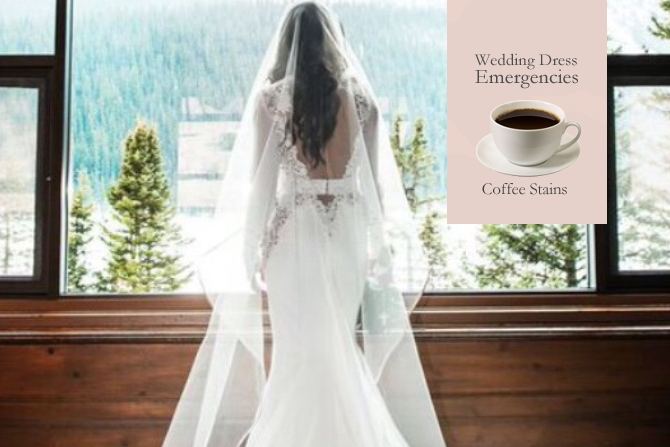 But if you accidentally get a drop of java on your gown, knowing what to do will be the difference between being panicked and being prepared. Sally Conant is a former museum professional and a PhD (Hint, she really knows her stuff when it comes to stains and cleaning). She’s also the President of the Association of Wedding Gowns Specialists. A network of specialty cleaners that offers industry leading wedding dress cleaning and care. A coffee stain, Sally explains, is a wetside stain, meaning it is water based. To remove it, your first step is to blot away the excess with a clean white cloth. Next, with an absorbent cloth behind the stain, blot it with a water moistened towel. Club soda, tide sticks or commercial coffee wipes also work. But, Sally advises to always be safe and test first on an underside seam. It’s also very important to NEVER rub vigorously (even if the package says so) because you could rub the finish off leaving a dull spot on the dress that cannot be repaired. The Association of Wedding Dress Specialists is the specialist recommended by PreOwnedWeddingDresses.com. We’ve personally met many of their members and know they provide a beloved, and delicate, wedding dress the expert care it requires. The Association is currently offering PreOwnedWeddingDresses.com users a $35 coupon for wedding dress cleaning and care. Use the discount for alterations, pressing, cleaning or preservation. Whatever your beautiful dress needs. You can register for the coupon here. And then rest assured that your gown will be cleaned by the industry’s best.